Following her previous outing, Natasha Lyonne stopped by the Build Series in New York earlier today(January 23rd) to continue promoting her Netflix series 'Russian Doll'. 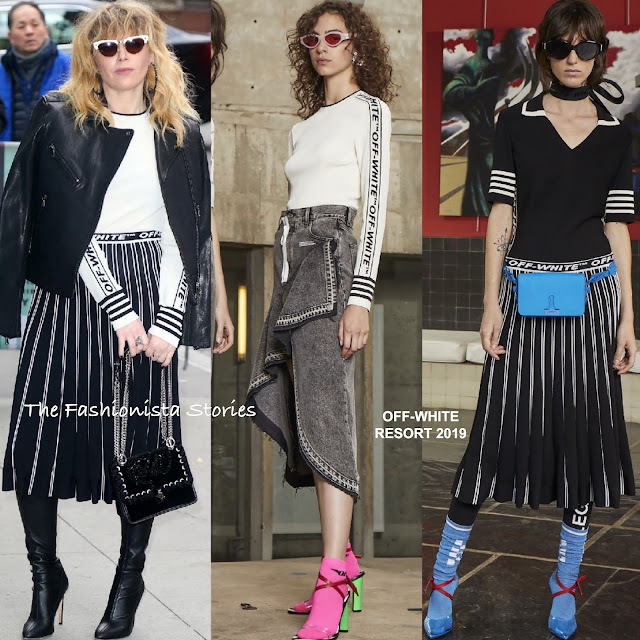 For her appearance, she wore an OFF-WHITE RESORT 2019 ensemble which featured a white & black stripe panel logo top and black & white logo pleated knee length skirt. If this skirt looks familiar, that's because Julia Roberts wore it in September 2018. She toughen up her ensemble with a black leather biker jacket thrown over her shoulders and black GIUSEPPE ZANOTTI leather boots. White cat-eye sunglasses, her signature hairstyle and a black chain strap bag finished up her look.